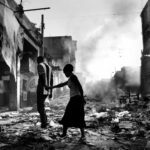 Over the course of his 18-year career, acclaimed Danish photojournalist Jan Grarup has covered many of recent history’s defining human rights and conflict issues with his camera. His work reflects his belief in photojournalism’s role as an instrument of witness and memory to incite change and the necessity of telling the stories of people who are rendered powerless to tell their own. His images of the Rwandan and Darfur genocides provide incontrovertible evidence of unthinkable human brutality, in the hope that such events will never happen, or be allowed to happen again. His work, The Boys from Ramallah and The Boys from Hebron, covers both sides of the recent Intifada expressed through the lives of children coming of age amidst the violence. Grarup’s images of the aftermath of the great earthquake in Haiti, which have earned him the esteemed Leica Oskar Barnack Award for 2011, take the viewer to the limits of human despair, dignity, suffering and hope. His images are relevant to us all because they form a chronicle of the time in which we live, but at times do not dare to recognize. Grarup’s work regularly appears in major magazines such as Newsweek, The Guardian, Sunday Times Magazine (UK) and other magazines worldwide. Based in Copenhagen, Jan Grarup works as a freelancer on both commercial and journalistic projects. Here are some of his views on his self-defining life’s work. Q: How do you perceive your photographic mission as a documentary photojournalist, and how do you think your new Leica M9 will be instrumental in your evolution as a photographer? A: Well, I think all photographers have one mission, which is to tell important stories. Some are focused (like mine) in war zones or areas that have been hit by catastrophes. The camera will be a part of me, like my other cameras. At the end of the day it is about if we can work together, but since I know Leica M cameras very well, I am sure we will do good. Q: You mention that you have been shooting with Nikon cameras, presumably DSLRs, but unlike many SLR shooters you rely on 28mm, 35mm and 50mm prime lenses. Why do you prefer shooting with wide-angle and normal fixed-focal-length lenses instead of zooms and telephoto lenses? A: I only use fixed lenses — I hate zoom lenses! It has to do with the fact that my lenses make me move around the things I photograph much more than I would do otherwise, which is a good thing. The 28mm, 35mm and 50mm are for me the lenses that give the best and most honest result in terms of the people who look at my work. Q: What brought you to Haiti to cover the earthquake aftermath? A: I was assigned by several international magazines, among them Le Monde and Russian Reporter — my thought was to try and make a story that would go beyond the “fast” news story, one with a bit more in depth. Q: As a photographer you were in Haiti to cover the earthquake aftermath through the lens of your camera and over the course of your career you have documented some very graphic and tragic scenes. Objectivity aside, what was your emotional reaction to witnessing what was going on in Port-au-Prince? A: I always find it very hard to cover stories like the one in Haiti, even though I have done so for more than 20 years now. From a personal perspective, it means that I try to work as hard and be as dedicated as possible. It is important that photographers who go to places like Haiti give 100% of themselves. From an emotional point of view, I reacted very strongly to the killing of the young girl, Fabienne, who got shot by police while trying to steal three frames with a flower motif. She wanted to sell them in order to buy food for her family. 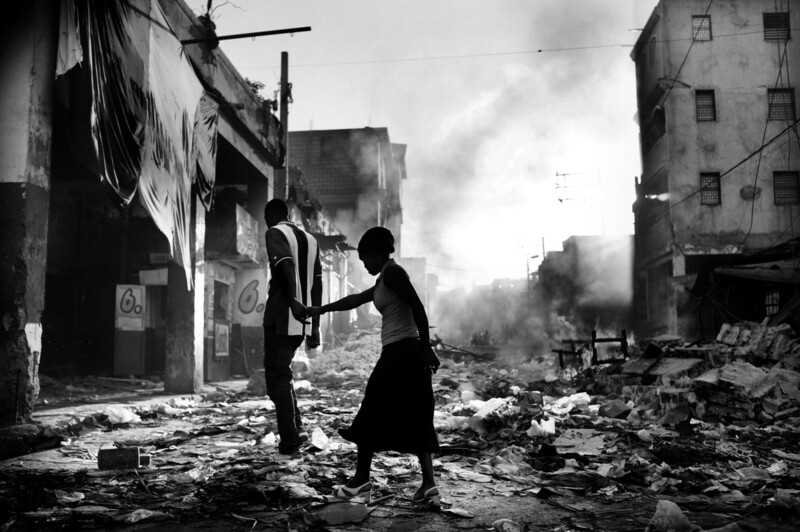 Q: Your compelling images of the aftermath of the great earthquake in Haiti are all in black-and-white, but you mention that you will try shooting in color as well with your M9. Can you tell us something about what motivates both these choices? A: Well, I do shoot a lot of color, mainly when clients want it. I don’t reject color at all; I just don’t see myself as a good color photographer. I have much respect for good color photographers. The best of them almost work “monochromatically” with the colors and I find that very hard. It is something I have to work on diligently! Q: What influence have the photographers that inspired you — Sebastiao Salgado and Eugene Smith — had on your work and what qualities in particular makes their images inspiring for you? A: Two things mainly — (though obviously there is much more to their work that is profound), but empathy and, to some extent, beauty come to mind. Salgado created pictures which on the surface are extremely beautiful even though they depict very rough issues, but if you look deeper into the work you see all the important stuff. At the end of the day it is all about the viewers and what they want to see! Eugene Smith is unique in terms of telling stories — he was a master storyteller. Q: Can you tell us something about your experience with Leica film cameras and do you think Leica lenses impart any identifiable characteristics to the images they capture? A: I do believe both the cameras (I’ve only used the M series) have qualities that are very rare — the size, the feel and the discretion is unique. The lenses are fantastic in the way that light finds its way through them. I do like my oldest lenses the best though — they have personality! You can’t screw around with them or they’ll get back at you! Q: Which Leica M lenses do you use right now and which ones are you planning to acquire to complete the M9 outfit you won as part of the Leica Oskar Barnack Award? A: I presently shoot with a 35mm and a 50mm. I am eagerly looking forward to shooting with the 28 mm! Q: Do you think your experience in Haiti is what prompted you to embark upon a project on child mortality in the world? And what is it that motivates you to pursue such difficult and heart-wrenching subjects? A: No — I constantly have many big projects, but Haiti made me work even harder on getting sponsorship for the things I am working on now. Q: Can you tell us something about NOOR, the agency of which you are a co-founder? What is its mission and what are some of the other large group projects you are working on in the immediate future? A: NOOR is an international non-profit organization based in Amsterdam, Holland for creating and distributing compelling photojournalistic works with the aim to raise awareness, enhance an understanding of the world and to contribute to the visual history of mankind. The foundation facilitates the production of photographic projects through exhibitions, publications and other (online) activities, stimulating public dialogue. Photojournalistic educational initiatives are at the core of the foundation’s activities. The NOOR Foundation’s mission is to provide the impetus to undertake documentary photography and educational projects and spread the NOOR philosophy. NOOR is conducting third world workshops and projects that it feels is vital for the world to see. Q: What characteristics of personality, philosophy or methodology do you feel are necessary to document people who are in stress and turmoil? Does their situation “get to you” and is there a positive aspect to your work other than inspiring people to help? A: ” Never trust a man of only one book.” I read a lot — I think it is important to have an inside look at many issues to give you a perspective on what is in front of your camera. Q: How do you see your photography evolving going forward? Have you ever thought about working in other genres besides documentary photojournalism? A: Never — it will never happen! If you’d like to see more of Jan’s work, visit his Noor Images site: www.noorimages.com/photographers/jangrarup/. For more information about the Leica Oskar Barnack Award, visit: www.leica-oskar-barnack-award.com. Agreed. Fantastic passion. Well deserved. CONGRATULATIONS ! SUCH A WORK !!!! very inspiring work, thank you! this is what it is all about, being able to tell compelling, moving stories with our images. Such great images and really thoughtfully shot. Love them. He is going to love that M9, can’t wait to see it working in his hands. First of, great pictures. Second, whats with the Leica folk trying to forcibly squeeze in questions about their product?? I thought these were unnecessary and tacky. Poor taste from a brand that prides itself on its heritage. Congratulations! Very nice work. You have the eye, and heart of a photographic storyteller.